Nvidia has made its first own-brand Tegra 4 tablet, the Nvidia Tegra Note, which comes with a stylus, vanilla Android and a palatable price-tag. We've heard tell of the Tegra Note before but under the monicker Nvidia Tegra Tab - the company even showed off an early version at Computex earlier this year. The name change is in part down to the addition of a stylus (for taking notes, see?) and doesn't so much echo as straight-up rip off Samsung's stylus-friendly tablet range of the same name. Nvidia's Note comes with a Tegra 4 quad-core Cortex-A15 CPU, 72-core GeForce graphics engine, 7-inch HD IPS LCD display and a 5MP camera on the back. There's also a front-mounted VGA camera for video-chatting (and selfies), plus 16GB of storage with a microSD slot for extra space. "The latest version" of pure Android will be coming to the tablet when it lands in-stores in October, which makes us wonder if perhaps Nvidia knows something we don't - like that Android KitKat will get a release date before then? We'll just have to wait and see about that. 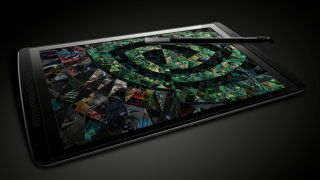 The Nvidia Tegra Note will be coming to North America, Europe, Asia-Pacific and India with a suggested price of $199 or £179 in the UK (around AU$215). What's the fuss about Tegra 4?